Roundabout is the free magazine delivered or mailed to all residents and businesses in Woodhouse and Woodhouse Eaves. An earlier version run from February 1978 by John Gillingham was called The Eaves-Dropper and based at St Paul's School, which, at that time, was designated as a community centre with funding from Leics CC. For the community by the community Roundabout aims to be topical and local, promoting local events and keeping everyone informed. It is normally published every month except August and January, with double issues published in July and December. It is supported by a grant from Woodhouse Parish Council, and also by advertising revenue, and is produced and delivered by volunteers. What's on locally The What's On diary on the back cover is free for organisers to promote local events. Advertising Advertising in the magazine carries a small cost. For further information contact the Advertising Manager via the Roundabout email address. Can you help? Help with contributions, ideas for articles, production and deliveries is always welcome and a great way to meet people, whether you're new to the villages or not. Contact us To contribute items, email Roundabout at roundabout@woodhouse-eaves.co.uk. 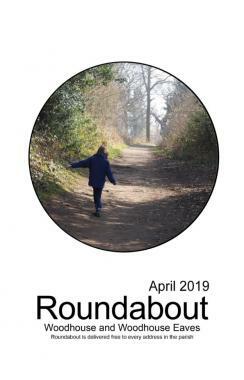 Sign up here to receive an email when new issues of Roundabout are available to download. Your address will only be used for this purpose by the Roundabout team.